Of course Tyler Seguin and Rich Peverley ripped home the only two goals for Dallas in the shootout to steal the extra point from Boston...Sport is a funny thing sometimes. In the much-anticipated return of former Bruins young-gun Tyler Seguin back to Boston, the actual game itself did not quite live up to the billing. However, at the end of the night, it's old friends Seguin and Peverley leaving Boston with 2 points and leaving the Bruins with another loss. The Bruins played another sub-par 60 minutes, a trend that continues over a stretch of two weeks now. The Stars were none better, playing on an equal level of sub-parness. Is it the dog days of the NHL season already? 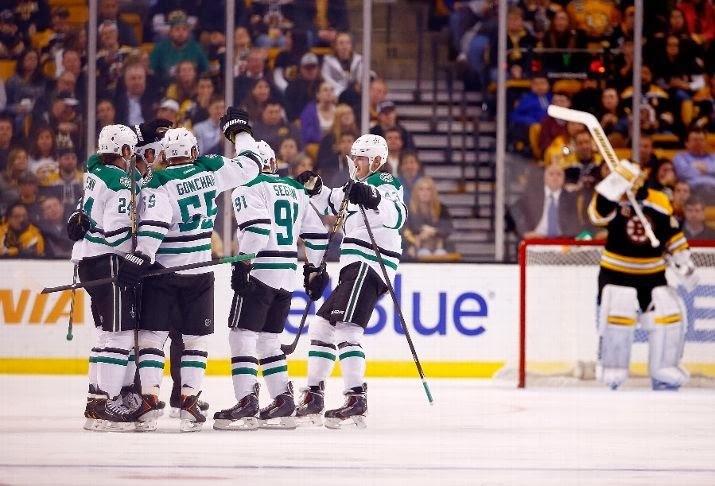 The B's started the game fast enough, out-shooting the Stars 15-4, but as the game played on, the Stars evened out the shots, with both teams ending with 36 on net. Stars captain Jamie Benn opened the scoring in the first, ripping a wrist shot over Tuukka Rask's shoulder to put the Stars up 1-0. But just 30 seconds later, Torey Krug registered his fifth goal of the season, slotting home a Reilly Smith feed on the doorstep of the crease to tie the game up at one. With a scoreless second period behind them, the Bruins played with some energy in the third, as they had their handful of scoring chances, with a few coming from Brad Marchand (MarSHAND, as he likes to be called now). But Marchand couldn't bury either, even with one coming at the top of the crease. The B's grabbed the lead at 11:39 when Milan Lucic got his 7th goal of the season, deflecting a Doug Hamilton snapshot from just inside the blueline. Most figured this would be the goal that would take the B's home and seal the deal. It had that kind of feel, after the grind they had been through for the previous 50 minutes. Alas, it was not to be, as Dennis Seidenberg hooked Vernon Fiddler on a breakaway, yielding a penalty shot. Fiddler capitalized on the chance, backhanding the puck past Rask, much to his dismay. The call was kinda cheap, as Seidenberg definitely hooked Fiddler's hands, but he instantly lost his legs (baffles me) and dropped to the ice. The refs will call a penalty every time, so that's the end of it, really. After a missed two-minute delay of game penalty that should have given the B's a powerplay in the final minute of the third, both teams headed into the OT period, where the Bruins got badly outplayed. In the shootout, Patrice Bergeron got the lone goal for the Bruins, but it was Seguin and Peverley who stole the show for Dallas, ripping home their shots past Rask and sending the B's and their fans home with the L.
The shootout loss keeps the Bruins in their funk, as they've now lost 4 out of 5. The week-long reunion tour inside the Garden continues with Tim Thomas set to play in Boston for the first time since his sudden departure last season when the Florida Panthers come to town Thursday night.